Be Seen – if you are seen, you are less likely to be inadvertently harmed. 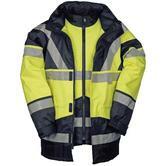 High visibility jackets and vests improve your visibility, especially in low light. Our hi vis clothing is all compliant with EN 471 visbility standard. Within the EN 471 standard there are 3 classes of visibility. You need the highest visibility (Class 3 ) if you are going to be in low light. Class 2 and Class 1 garments give relatively less visibility for the wearer. 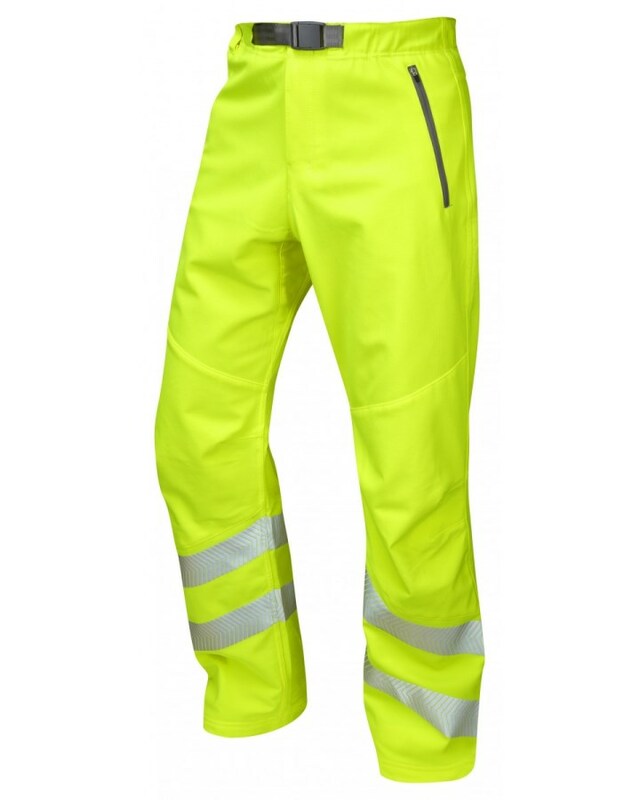 If you match a Class 1 hi viz trousers with a class 2 high viz vest, you get a total Class 3 visibility. The hi vis vest is the most versatile and simplest way of being seen. (Typically this is fluorescent yellow, with 2 5cm reflective tapes and bands, giving Class 2 visibility.) 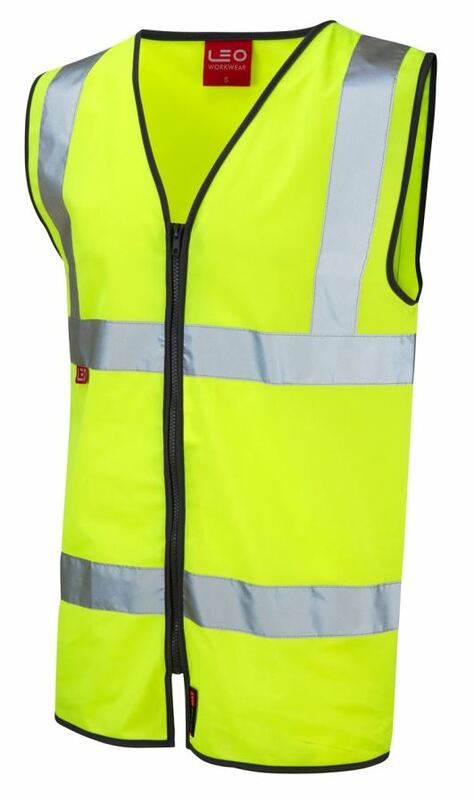 We do hi vis vests in about 10 different colours (see the Leo Pilton hi vis vests in various colours. These are useful to colour code staff in different work areas, for safety purposes. 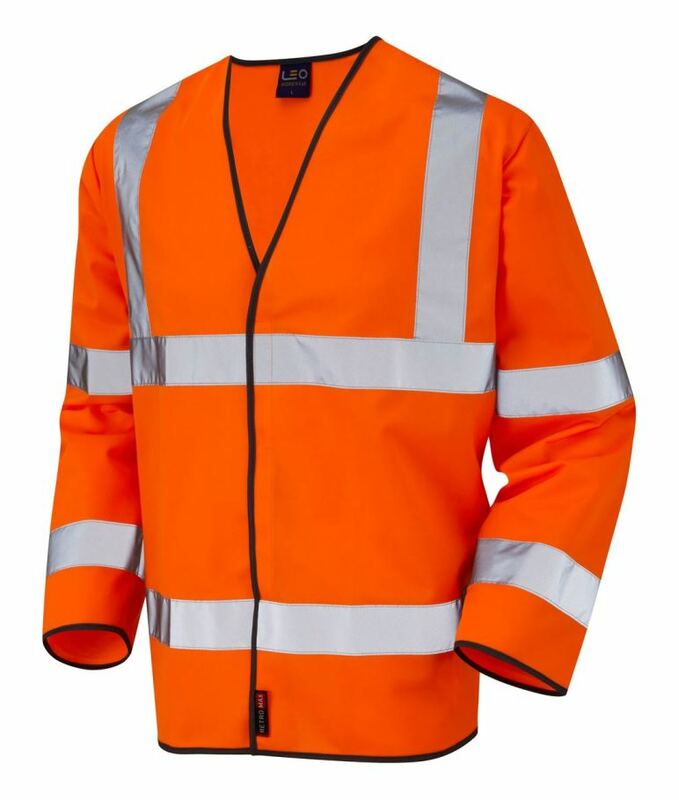 We also offer the full range of orange Rail Industry | GO/RT hi viz clothing – as required for workers near rail lines. A Hi viz jerkin is like a hi viz vest, but with short sleeves. 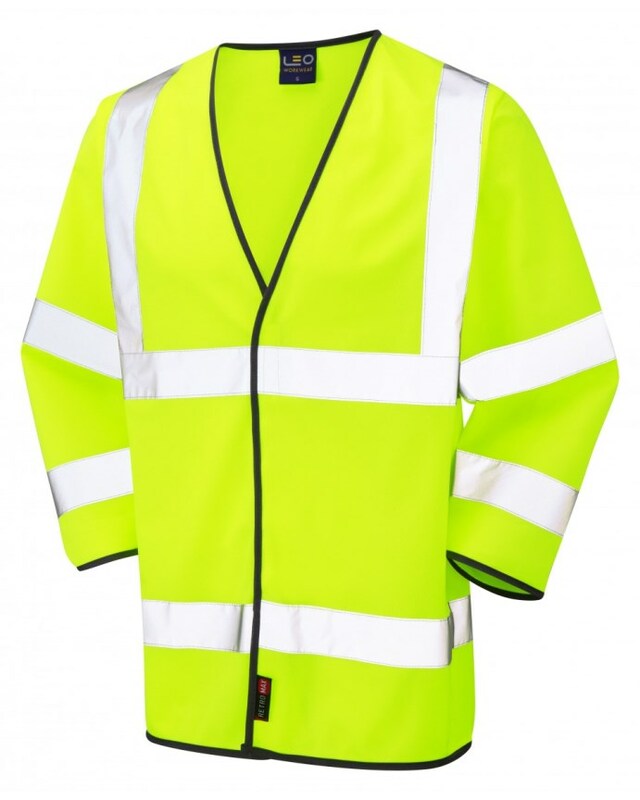 Hi vis jackets come typically as 3 in 1 or up to 7 in 1 jackets – with removable sleeves, hoods, and even removable hi viz body warmers. Some users find the reflective tape quite restrictive. Did you know that, by using segmented reflective tape you can have the benefits of reflective tape visibility, but with far better ease of movement? Segmented reflective tape is increasingly popular and fully EN compliant. Segmented tape allows the garment to stretch with your body, when needed. We have these hi viz garments using segmented reflective tape: Segmented Reflective Tape products. There are three types of signalling garments. The garments requiring luminous base material coating and garments requiring retro-reflecting material coating or alternately, garments coating made with both features. This standard contains the general requirements of the protective garments, defined as covering or changing the personal garment and designed to protect against one or several dangers. On the product itself or printed on a label secured to the product. Set to be visible and legible. Name, commercial brand. Description of the product type. Description of the size. Number of the appropriate standard. Signs and, if necessary, performance levels.The "i" marked on a pictogram specifies the need for the user to refer to manufacturer instructions. Motioning the user's presence, in order for him to be detected and seen evidently under dangerous conditions, by day or night under all luminosity situations, in the spectrum of head lights. Class 3 High Visibility: The class 3 defines the highest visibility level. E.g. Jacket with long sleeves, parkas jacket. Trousers suit. Minimum background material 0.80m2. Minimum retro-reflective material 0.20m2. Class 2 High Visibility: The class 2 defines an intermediate visibility level. Example: vests, tunics. Minimum background material 0.50m2. Minimum retro-reflective material 0.13m2. Class 1 High Visibility: The class 1 outlines the lowest visibility level. Example: shoulder-belts. Minimum background material 0.14m2. Minimum retro-reflective material 0.10m2. Class of coating of fluorescent basic material (0 to 3) : It gives the class category of the visible material of retroflection and fluorescent. Class of reflecting material (0 to 2) : It gives the class category of the retro-reflecting material according to its retro-reflection coefficient. 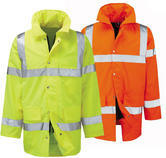 Class 3 workwear must be worn by everyone operational on roads with normal speed limits, near railways and under cranes. It must also be worn by members of the emergency services. As a general rule, a set of workwear always creates class 3 workwear. A typical mixture is trousers and jacket. However, a arrangement of shorts and traffic waistcoats also observe class 3 standards. A hi vis boilersuit by itself is classified as class 3. Hi vis Parka coats, such as this Gore-Tex hi vis parka and that are worn separately are ranked as class 3 standard. 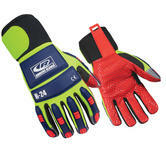 Class 2 workwear must be worn by supervisors working in spaces where class 3 workwear is required. Class 2 workwear usually consists of a hi vis traffic waistcoat, hi vis bib and brace or a hi vis T-shirt. Class 1 usually consists of hi vis trousers . 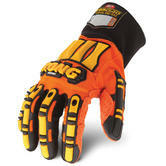 These must be worn by visitors to areas where class 2 or class 3 workwear is mandatory. Visitors must be accompanied by the people working in the area. The law specifies that the employer is responsible for ensuring that acceptable protective workwear is available for everyone's disposal in the workplace while the employee is responsible for its proper use. To guarantee proper use of your Hi Visibility workwear, the jacket must be zipped to guarantee that the reflective tape is not noticeably broken and the reflective tapes on the legs must not be covered by the boots. The GO/RT 3279 standard is founded on the European standard EN 471:2003. GO/RT garments must meet at least class 2 of EN 471 for the smallest area of high visibility materials used within a garment. Whereas the European standard allows different colours of high visibility materials, the railway standard stipulates an orange colour. Railway locomotive headlights pick out retroreflective materials in high visibility apparel. The railway standard draws on EN 471:2003 and requires materials for use that meet the maximum level of photometric performance criteria that are specified within the standard.